Hi guys! I just had to pop in and share this One of a Kind piece we did for this month's Spookytime Jingles update! 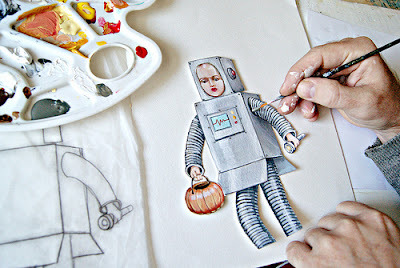 We knew that we wanted to go a bit beyond the typical orange and black, witches, and ghosts, and we both agreed that we should paint a robot! Well, we just had to pay tribute to one of our fave Halloween costumes of all time. 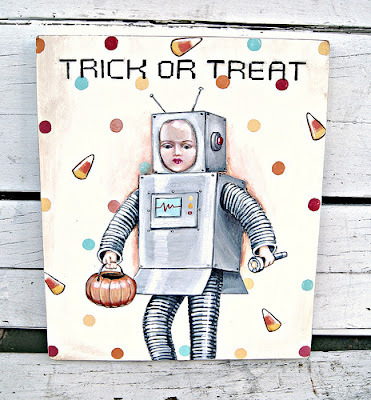 This is totally hand painted and we added some dimension to the piece by first painting the little robot on watercolor paper, then we cut it out and adhered it to the board which we hand painted with festive polka dots and candy corns. 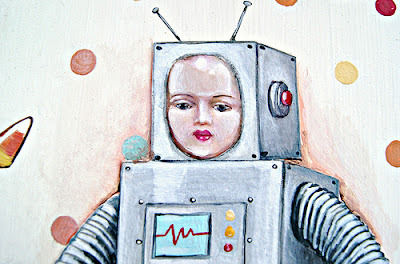 This is a One of a Kind original 100% hand painted mixed media creation. This 8 x 10 wooden plaque comes signed, dated, and ready to hang. $105.00 includes FREE shipping in the USA! If you'd like to add this special piece to your Halloween decor just shoot us an email. 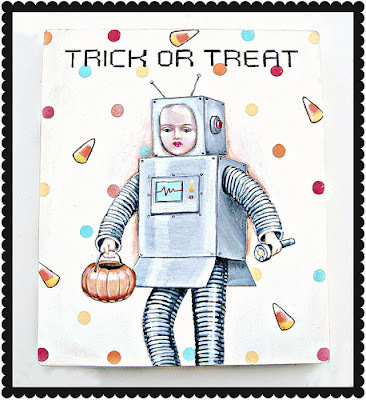 And be sure to visit SpookyTime Jingles to see lots more OOAK art by some amazing artists! Very cute! 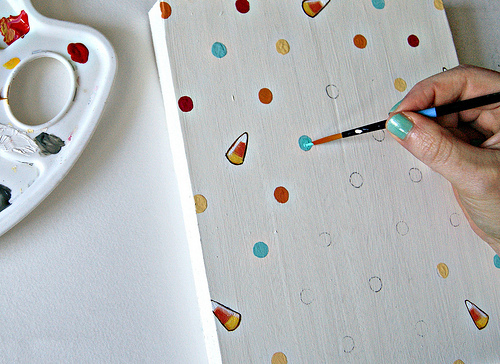 And I love that you showed your process! This is AMAZING!! I loveeeeeeeee the candy corn bits!!! Brilliant! I love it! Unique, quirky, fun - best of all I love how you and Aaron worked together to create this piece. You two are a real inspiration! That is so cute! Love it! Did this sell? Do you still have it?